DEREK: "I was being nice to her." DEREK: "I can be nice to her without being-"
PRESTON: "I know it was probably you who convinced Cristina. She's very strong, but she listens to you. If you told her to move in... Anyway. Thank you." MEREDITH: "You have an increased level of serotonin in the blood." PRESTON: "Which creates a false sense of euphoria." TOM: "So Naomiâ€™s not actually this happy? She just has a tumor?" NAOMI: "You people with your tumors. I tell you, Iâ€™m infected with love!" [to Meredith] "You know, you are a gorgeous young woman. Look at you! You know, you should smile more." Permalink: Destructive, aggressive hell-dog available! DEREK: "Yes, compassion, It's an emotion. Have you ever heard of it?" CRISTINA: "Have you? She's barely back on her feet and you've got her calling you McDreamy again. You know, I was just telling the patient the truth. You might want to try it sometime." "I'm a surgeon. There ain't no damn slowing down." Permalink: I'm a surgeon. There ain't no damn slowing down. Permalink: Eating is a sport? SOPHIE: [to George] "Ooh, an Irishman! I love the Irish. They have a sparkle, you can see it in the eye, and the swagger. Oâ€™Malley, show me the swagger." SOPHIE: "The eyes are right, but youâ€™ll have to work on the swagger!" GEORGE: "Why is she still here?" NURSE: "Because I am not a bouncer, and this is not a nightclub." GEORGE: "Iâ€™m putting my foot down, either the dog moves out or I do. Foot, down, now. Me or the dog, which is it? [pauses] You hesitated! She hesitated!" MEREDITH: "I didnâ€™t hesitate, I was thinking." GEORGE: "You have to think about it? Fine, Iâ€™m moving out right now. Later, Iâ€™m moving out later. Right now, I have rounds." CRISTINA: "We're in an elevator. That's your specialty, right? McDreamy moments in the elevator?" CRISTINA: "You know what? For just a moment, Iâ€™m not Dr. Yang and youâ€™re not Dr. Shepherd. Youâ€™re the guy who screwed up my friend. The guy who drove her to get a dog she can't keep, the dog she only got because her boyfriend lied to her about his wife." DEREK: "I never lied to her." CRISTINA: "Yes you are. You know, I know a liar when I see one because I am a liar." MEREDITH: "Hey, why aren't you busy prepping for rounds and stealing all the good cases?" CRISTINA: "Why aren't you busy prepping for rounds and stealing all the good cases?" CRISTINA: "No reason." [pause] "Burke thinks I moved in with him." MEREDITH: "McDreamy and I have a case. Wait. He thinks you moved in with him?" 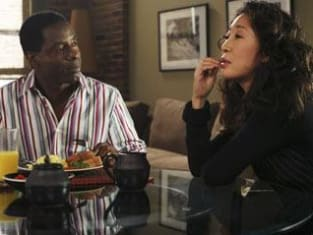 CRISTINA: "You're calling him McDreamy again?" CRISTINA: "What are you doing?" MEREDITH: "What are YOU doing?"